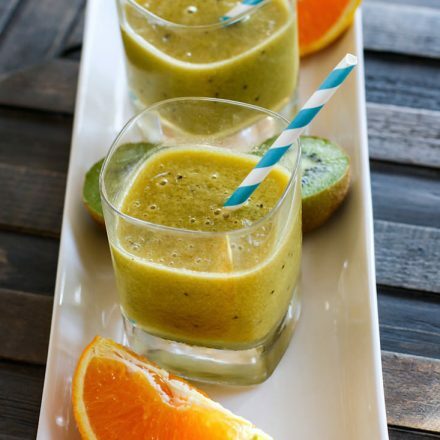 Needing a boost of energy ? 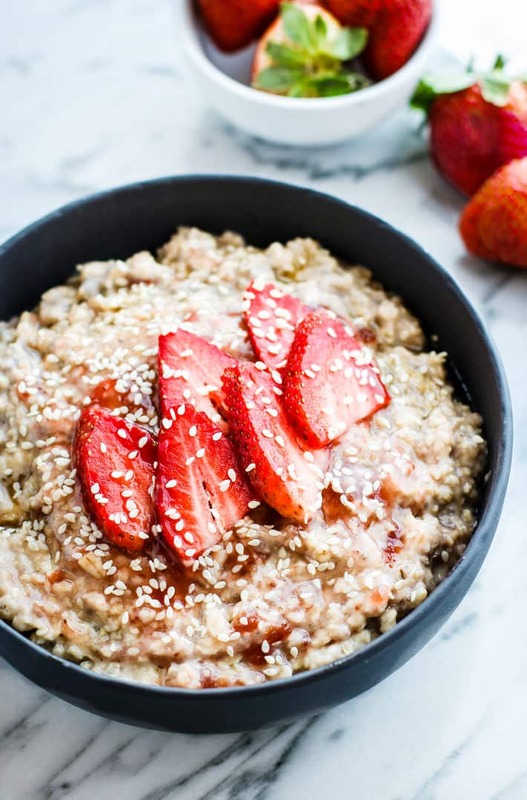 Try this Honey Sesame Strawberry Overnight oatmeal! 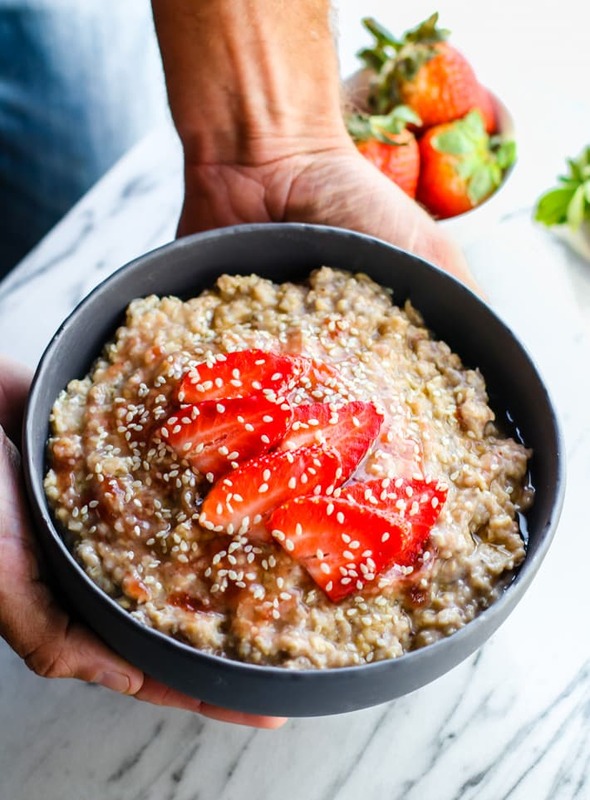 A light and naturally sweetened overnight oatmeal that is gluten free, vegan, simple to make, and loaded with extra nourishment! Happy Spring! Although it sure feels like almost Summer here. Yikes! I’m scared for Texas. We might melt before June. But for now, I’m gonna embrace the aroma of all things light and SPRING(Y)! Like strawberries, honey, and overnight oatmeal. COLD gluten free oatmeal, yet still comforting and refreshing. Yes, I said cold. Are we the only ones that eats overnight oatmeal cold? We don’t reheat it in the morning, more on that later because I can’t get off topic here. Where was I? Oh yes, this flavor combo. As mentioned above.. spring AROMA…. 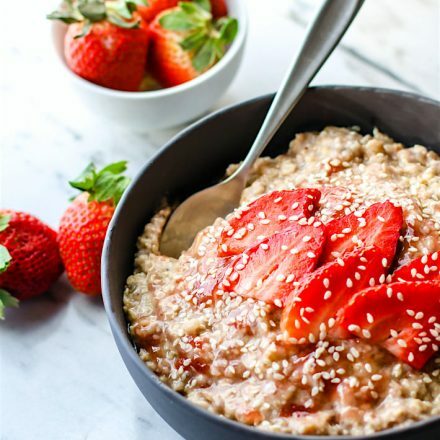 honey, strawberry, and SESAME all bundled together in soaked creamy gluten free oats. I first started making overnight oatmeal for my husband (and myself) back in 2010. Man that seems long ago. But this is when he was knee deep in ironman training/racing. I was also training for half marathons and teaching. I look back at our activity and cringe. Whoa, how did we function? Why did we put ourself through that? Haha! Talk about biting off more than we could chew! Lesson learned! Regardless, it was a busy time and we needed all the extra energy we could get and FAST! Overnight oatmeal became a staple in our house because one, they could be prepared the night before which made 4:45am wake up calls a little easier. And two, because allowing gluten free oats/seeds to soak made it easier for digestion and therefore nutrient absorption. By soaking or fermenting grains/seeds/legumes you help reduce and breakdown (somewhat) of the phytic acid; an anti-nutrient. It’s an anti-nutrient because it binds minerals in the digestive tract, making them less available for our bodies to absorb. That’s not something you want when are relying on FOOD as FUEL. Am I right? We ALL need minerals, we all need vitamins, and if your immunity is weak or you are knee deep in some sort of athletic training, you need EXTRA! 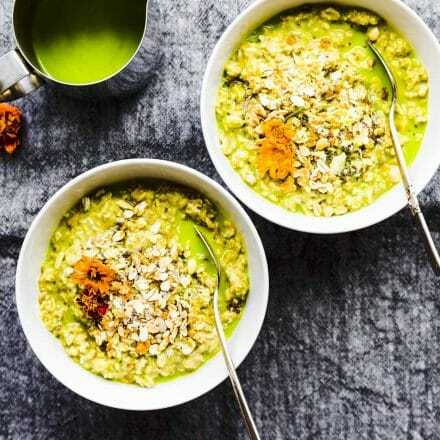 Now you see why soaking grains, like in overnight oatmeal, are not only a great meal prep, but also key for those having trouble digesting grains and for digestive health in general. Does that make sense? Am I boring you yet? Nah, you like Corny Nerdy Cotter syndrome. Stay with me here! 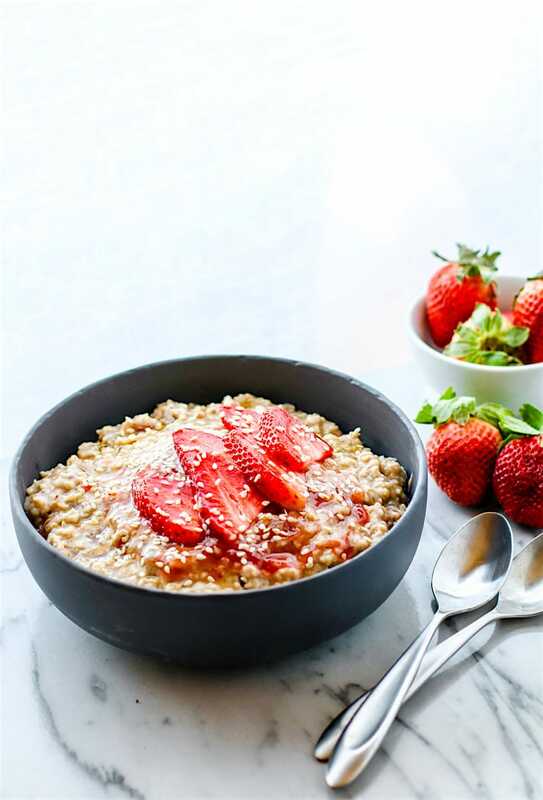 Let’s take these strawberry honey sesame strawberry overnight oatmeal. 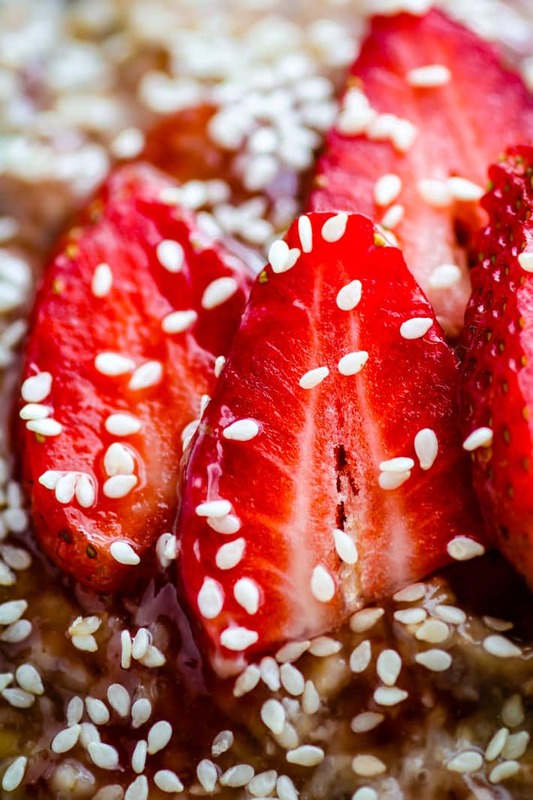 Look how pretty those strawberries and sesame seeds are. Gah.. I love it! But more importantly, I love what this dish provides in regards to nourishment. 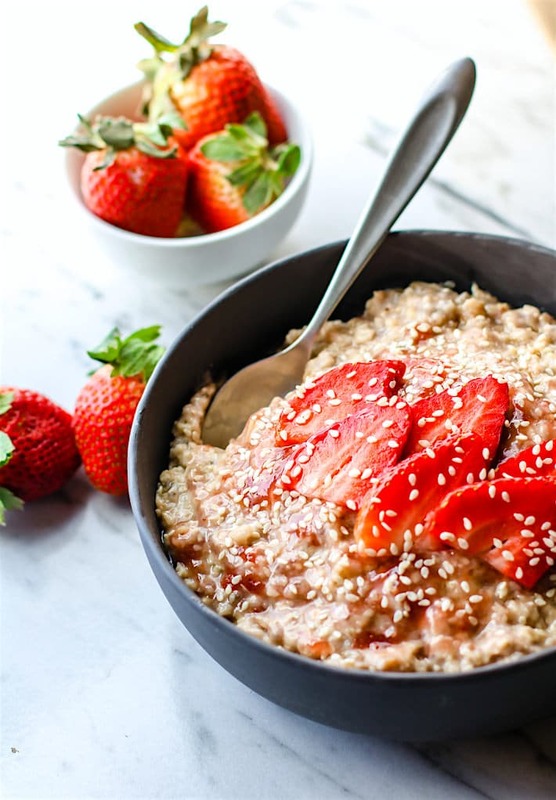 This honey sesame strawberry overnight oatmeal dish is filled with vitamins and minerals! I added almond butter to these oats, which is rich in Vitamin E. See, sesame and almonds work together! The honey is also rich in vitamins, minerals, amino acids, plus has antibacterial properties which help boost immunity. Combine oats, water (or milk), coconut cream, nut butter, ½ tbsp sesame, optional chia seed, salt, vanilla, preserves, and honey into a small mixing bowl. Mix well and then let it sit overnight in fridge. remove from fridge and spoon into bowls. Add sliced strawberry on top extra sesame seed. Add more milk and honey if you want it creamier. ENjoy! for gluten free quick oats we used lovegrown foods brand. 340 to 475 calories, depending on your serving size and type of milk you use. It’s still relatively lower in sugar compared to most other packaged flavored oatmeals (12 -15 grams), has over 11 grams protein, and 45-60 grams carbs, 10 grams fiber. 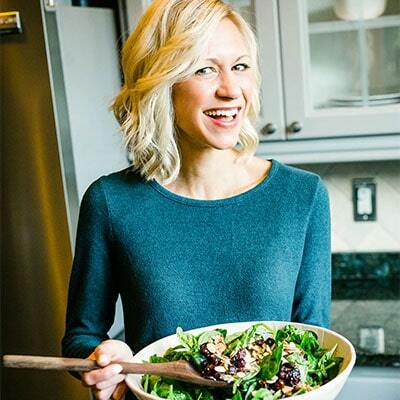 NUTRITION –> This overnight oatmeal dish has anywhere between 340 to 475 calories, depending on your serving size and type of milk you use. It’s still relatively lower in sugar compared to most other packaged flavored oatmeals (12 -15 grams), has over 11 grams protein, and over 20% IRON per serving. YEA! Plus allowing all these nutrient rich ingredients to soak can definitely do wonders with absorption. Soak in coconut milk, almond milk, buttermilk (fermentation health perks), cashew milk, or water. Although I highly recommend the coconut milk route. It’s delicious. 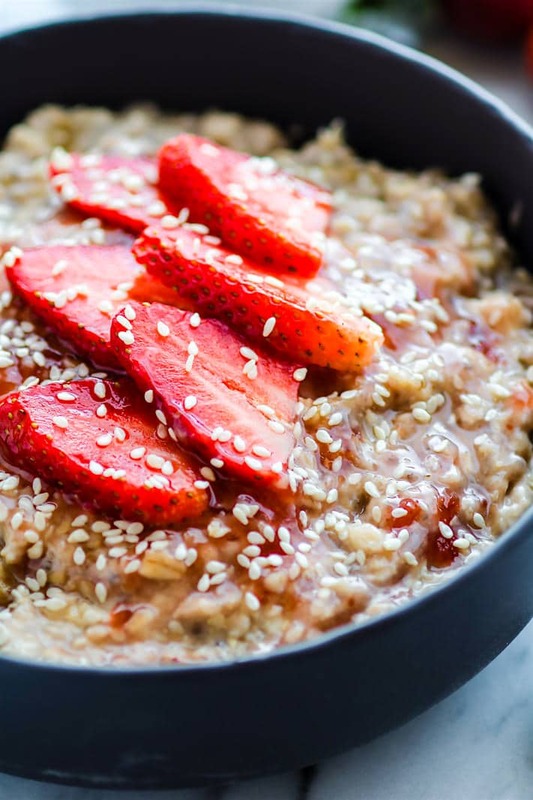 Think of overnight oatmeal as a “more bang for your buck” breakfast! AMEN! Now let’s dig in! Now that’s I’ve gone off on a nerdy nutrition tangent, I’ll finish with some light hearted questions to ponder. What’s your favorite Spring produce? Do you ever use sesame in sweet dishes? 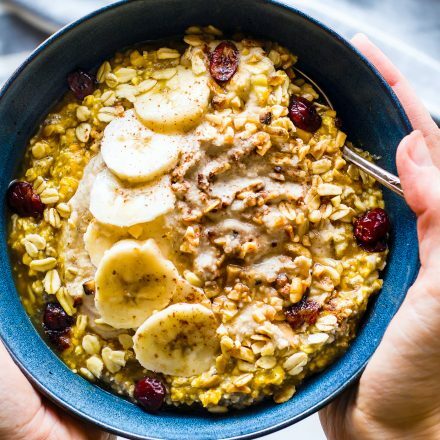 Overnight oatmeal, are you a believer? I expect answers for all below please. Kidding… kinda. Look at those beautiful berries! And YES…I can always use a burst of energy! Love this easy make-ahead breakfast!! I never thought about adding sesame to it. It’ll surely taste amazing! let me know if you do Debbie! Sesame and honey are a natural pairing. I don’t even really like honey that much, but sesame has a balancing nuttiness to the floralness of honey that makes it work! So pretty! I made some overnight oatmeal last night to help. In still having a lot of issues. I think I may already be melting. Finally had to turn on the a/c last night. It was 94. It’s March! I’ve never used sesame in sweet dishes and I love pretty much all spring produce! We are trying to so hard to have warmer weather…but the cold is still lingering a bit. And now I have the perfect breakfast for tomorrow – I have a 4:20am morning filled with clients. I usually do a smoothie, but I’m going on a run in between (3miles) and could use the extra fuel! I love COLD overnight oatmeal. There is something so delicious and refreshing about the texture. YUM! I have never used sesame seeds in a sweet dish, but I think it is a great idea. I will have to give it a shot. I so agree! and let me know if you try it Chelsea! Woooooooooooowee! My hat’s off to you for training for Ironman while working and trying to keep up with life…I can’t even imagine! I LOVE overnight oatmeal and can definitely see this being the preferred go-to for early mornings and for staying fueled while training for an event. Incredible how all it takes is a little pre-soak to unlock our food’s nutrient value! P.S. those strawbs are goooooorgeous! ya, I didn’t train for ironman but i felt that tired. Goodness my more adrenals! SOAKING to the rescue! you know i thought of you! I love the addition of the sesame seeds in there, looks so yummy! I haven’t been doing much oatmeal at all… it never rally got cold here so I just didn’t want it. Helloooooo overnight oats. I need to start doing it again. Can you come cook for me while I can’t walk though? We have wine. Yes, on my way! pour the wine! yes to those COLD overnight oats, that’s the only way I eat overnight oats! This is happening very soon! Oh yes please! Such a fan of overnight oats. I used to make them in a mason jar and take them to work – oh the looks I got, haha! Gotta go out tomorrow and buy strawberries. Pretty indeed! now that is genius! i gotta try mason jars that is just BRILLIANT! like you! miss you! have you tried the overnight oats with protein? we love adding that too! Cold oats Keeps you cool during summer. haha. right now, I’m obsessed with asparagus but why are they so freaking expensive?????? 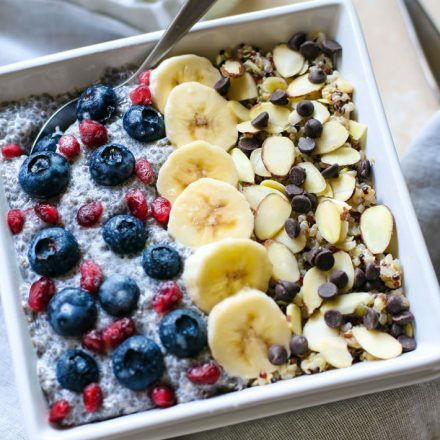 i don’t like warm oatmeal..so the idea of overnight cold oatmeal sounds wonderful..this is such a pretty bowl!!! ❤️❤️ are you feeling better? That looks like a winning bowl to me. I am a fan of overnight oats, but I often forget to make them the night before, which totally defeats the purpose, so then I am stuck with just regular ‘ol oats, Ha! Ah well. I need to set an alarm or something to remind myself to prep them. My spring produce love has always been asparagus. p.s. I finally got around to listening to your feature on Blissful Bites, I loved it, great job friend!! so glad! Nicole’s podcast is so encouraging!! thank you for listening. Confession: I prefer eating most of my foods cold, soI’m definitely with you on the “no reheating” bandwagon 😀 And while I’ve done the strawberry and honey combo, I’ve never added sesame seas. I’m intrigued! why i love you! cold food friend. <3 haha. This caught my eye on Instagram and I just had to check out the recipe! I have been trying to start getting in the habit of making overnight oats, I find it is so much more satisfying to eat in these hot mornings that are coming, and I loved the addition of seasame seeds. It would make such a nice change in flavor when you get tired of the typical ones, and I love that it has a nice calorie count, I have found big breakfasts to be the best, especially after morning workouts! Totally! I’m starved post morning workout. Let me know if you try it Hilary! We love overnight oatmeal over here and we never reheat it! I’m always of killing the beneficial bacteria! I love the strawberry/sesame combo! haha yes! so smart!Keep that good bacteria active! Give me all the science talk Lindsay I love it!! And I love overnight oats, seriously the best breakfast a girl could ask for on a busy morning!! I have to try the sesame seed strawberry combo, sounds delish! Oooooooh, this flavour combination sounds so so good! The freshness of strawberries goes so well with nutty flavours! yes, love the nutty texture too. I”m nutty! haha thanks Kristy! I love using coconut milk in my overnight oats! I’ve been more into steel cut overnight oats, vs quick, but all the ingredients is making me want to try just quick by itself again. It sounds so amazing and I love the nutrients!! oh yes, those oats make it even thicker! love that ash! This looks so yummy I may actually eat it. I’ve always loved the idea of overnight oats, but I just can’t deal with the consistency. This looks magical though! you mean the porridge like consistency? do you like thicker or thinner batter? you can totally adjust them. Oh my, Texas heat?! I HEAR ya! Growing up, our Spring break was in March and they were always HOT! My family comes here during Summer to escape. It’s one thing I don’t miss about living in TX. No doubt 2010 sounded crazy! Isn’t it funny how when you look back at times like that and wonder how you ever did it all!? 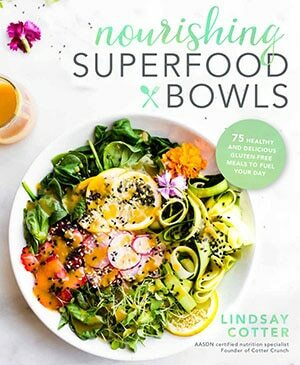 Lindsay, we’ve been eating overnight oats for a long time.. so I love all the information you’ve shared here. It’s the ultimate fast food! I love how you’ve added sesame seeds and coconut milk! I’ve done neither and coconut milk? OH Yeah!!! Can’t wait to stir in these things. Thank you for this my dear! thank you friend. I hope you like it! Oh my goodness, this looks delicious! Sounds satisfying and filling, too– what a perfect breakfast. how about you come here for spring then i come there for summer? best of both worlds! I actually ate oatmeal for the first time in like ten years. Yes, I’m probably one of the few HLB bloggers who doesn’t eat oatmeal or oats in a jar for that matter. I didn’t hate them, and I really dig your flavor profile here. Haha I’ve never done oats in a jar: and I’m the blogger who dislikes FROYO. Gasp! I love overnight oats especially in the warmer weather. I am always looking for new combinations. I recently found an almond / coconut combo milk and seriously like it. So glad the fresh strawberries are back. 2010 WAS ages ago!!! It’s so weird to think… 6 years is a quarter of my life. oh my God. Also you guys are both crazy and so inspiring. I definitely would not wake up at 4;45 unless it was to catch a plane to Mexico heh heh heh. I LOvE the addition of sesame seeds! 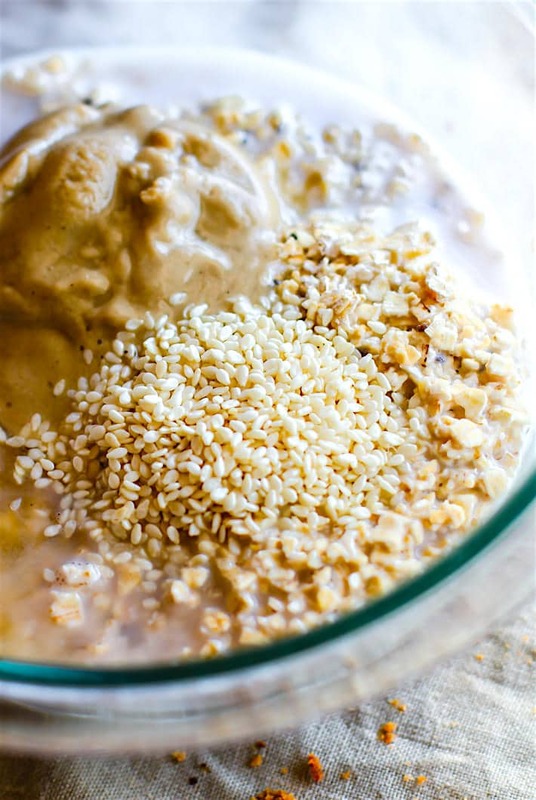 I might swap tahini for the almond butter just to up the sesame goodness in this breakfast. Thanks for the inspiration! yes, i’ve use tahini too! both work great. Let me know if you try it!